THE all-time classic picture book, from generation to generation, sold somewhere in the world every 30 seconds! Have you shared it with a child or grandchild in your life? Including a special feature, die cuts, this beautiful board book edition, perfect for teaching the days of the week, offers readers an interactive experience. 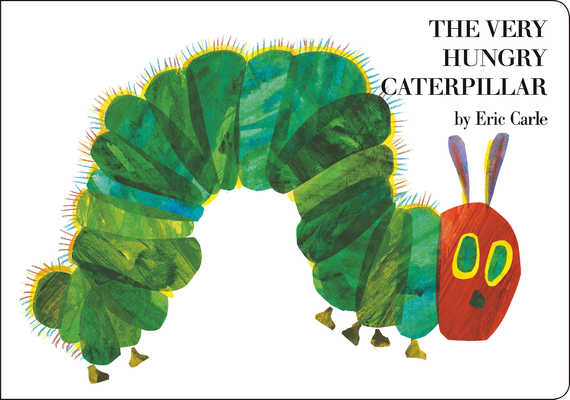 "The very hungry caterpillar literally eats his way through the pages of the book—and right into your child's heart..."
Eric Carle's art is distinctive and instantly recognizable. His art work is created in collage technique, using hand-painted papers, which he cuts and layers to form bright and cheerful images. Many of his books have an added dimension - die-cut pages, twinkling lights as in The Very Lonely Firefly, even the lifelike sound of a cricket's song as in The Very Quiet Cricket - giving them a playful quality: a toy that can be read, a book that can be touched. Children also enjoy working in collage and many send him pictures they have made themselves, inspired by his illustrations. He receives hundreds of letters each week from his young admirers. The secret of Eric Carle's books' appeal lies in his intuitive understanding of and respect for children, who sense in him instinctively someone who shares their most cherished thoughts and emotions. The themes of his stories are usually drawn from his extensive knowledge and love of nature - an interest shared by most small children. Besides being beautiful and entertaining, his books always offer the child the opportunity to learn something about the world around them. It is his concern for children, for their feelings and their inquisitiveness, for their creativity and their intellectual growth that, in addition to his beautiful artwork, makes the reading of his books such a stimulating and lasting experience.